Starting a tour from our own front door made for a pretty chill Day One. I puttered around a bit doing final chores like giving the garden beds and pots an extra-heavy watering. We ate a good breakfast and gave it time to settle, made sure we had all our chargers and whatnot, and pedaled out of our driveway and up the hill. The forecast looked a little brighter when I checked the long-range forecast about a week ago. Looking at it again last night I saw somewhat lower temperatures but still no serious rain forecast to dampen our spirits. This final check was to ensure I didn’t need to add anything to my packing plan. We rolled out under gray skies with the promise of clearing toward the afternoon. Hubs promptly dubbed his fully loaded commuter The Beast. He has new bags for the front to add some capacity and this was the first outing with bags front and rear. We utilized trails to wend our way through downtown Seattle, although in hindsight it would have been more efficient to use the 2nd Avenue protected bike lane and avoid all the tourists wandering around the waterfront. That’s fine–this is a vacation, not a race. We appreciated every bit of trail mileage and every bike lane along the way. The Ship Canal Trail, Burke Gilman, and Interurban North made up a good chunk of the way, and we got to ride on a PBL in north Seattle. The biggest challenges came at some of the crossings that required us to do some pedestrian dances due to fast, heavy driving traffic, and in any stretches involving highways or arterials. The sun brightened a bit but the breeze kept us cool enough to keep our long sleeves on. I was just right in a Nuu-Muu, short-sleeved merino tee, long-sleeved bolero, and knickers over the knee. I started out with leg warmers that I took off about an hour into the ride. We made a couple of coffee-shop stops to use the bathroom–buying a coffee was the rent we paid and I’m pretty much always fueled by caffeine anyway. I’ve learned that I need to give my legs a break about every hour or so, even if it’s just to stop, eat a couple of bites of a bar and have some water before rolling again. I don’t want to stop for so long that I cool down–just stop the rotating for a few minutes. It also eases my saddle contact, although I make a habit of standing up off the saddle on any downhills to take a break there, too. 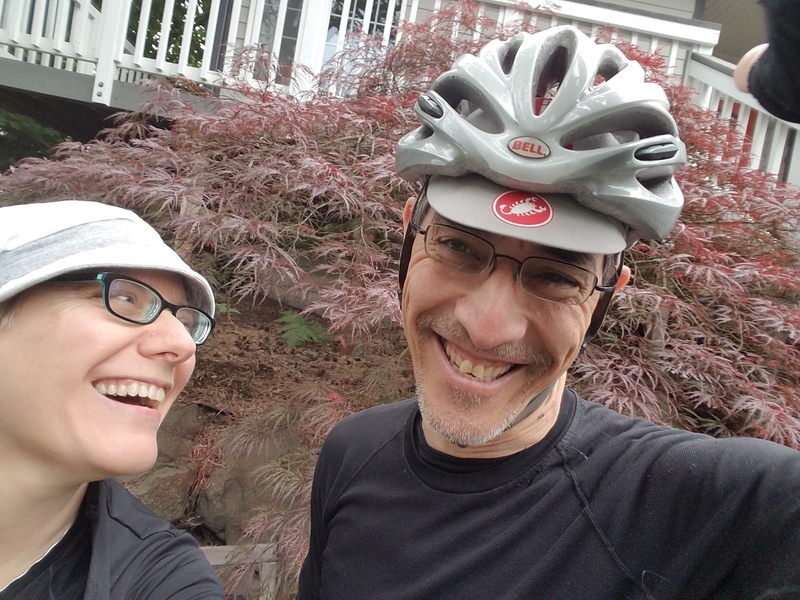 We rolled into Mukilteo a few minutes after 5pm, humming downhill on State Route 525 (the main drag that brings you to the ferry landing), and dropped our stuff at Hogland House, the bed and breakfast we chose for its proximity to the ferry and restaurants. It has a beautiful view of the Sound from a quiet dead-end street, enlivened by the sound of trains running along the shore a few hundred yards away every so often and the occasional toot of a ferry horn. We rode to dinner although we could have walked–this location provides great access to several nearby restaurants a half-mile or so away. Had a great dinner at John’s All-American Grill, rode back, and settled into the hot tub in the back yard with a long “aaaah” of satisfaction as the sun set over Puget Sound and a bunny rabbit nibbled on the lawn. Distance: 40.45 on my cyclometer, a bit farther if you ask Eric’s bike or Ride with GPS. Tomorrow: Ferry and biking and ferry, oh my. Note for route planning: You could also skip the whole urban segment and take Amtrak to Mukilteo. It’s an easy, comfortable way to travel and you’ll get some great miles along the shores of Puget Sound to enjoy the scenery. They hang your bike in the baggage car so you’ll need to take bags off and carry those onto your train car.